One of the good things about having very few female rappers in the Kenyan music scene is that their creative playground is still wide enough for each of them to develop their own unique sound and style, often without having to deal with accusations of trying to sound like someone else. It is in this space that yet another female rapper is gradually starting to make her mark. Let us introduce you to Ladybud, or Mami Gangster. 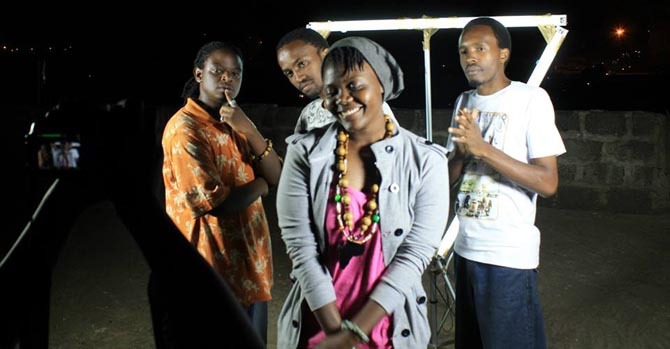 Quoting musical influences such as Wu-Tang Clan, Immortal Technique, Lil Kim, Angel Haze, Rapsody and Nazizi, Ladybud began to hone her craft with a Limuru based outfit called Punda Musik. She’s featured in some of Punda Musik releases including Mov3. She is currently working with Warlock Music and plans to release her first mixtape Mami Gangster soon. Ladybud at the Wipe Me Down shoot. Even though she has faced a lot unpleasant experiences such as having to put off going to university for a while, she considers her involvement with rap music as a refuge and release of some sort. That being said, signs of those difficult moments in her life can still be felt in her musical style and lyrical content. Her first solo music video release courtesy of Top Notch Films is Wipe Me Down, which can only be described as three minutes of lyrical braggadocio and some pretty entertaining tales of getting high on weed and liquor. It is an ideal track to introduce new listeners to her style, which is not something you hear everyday around these parts. We’re yet to listen to her tracks on other themes but she does this stoner rap thing very well. That could be all she raps about and still sound great.